Well, off late, there has been much hue and cry about apple iphone 4 and it’s shortcomings. If apple is trying it’s hand at alternate marketing strategy, the plan clearly seems to be working. Amongst the many flaws cited, the battery indicator not being accurate is something I could not raise my eyebrows upon. Despite having had 5 phones (of different brands, must I add), I have come to conclusion that battery indication has never been what user (or I) expect it to be. I want my charge indicator to be a bar with linear dependency, with the slope indicating my phone’s battery consumption rate. If I know I can talk for 4 hours, on a full charge, I should be able to assume, that I can talk safely for 2 hours, if I see my battery bar to be 50 %. Well, I’m claiming it has never been so. The time I get before I draw first blood from my phone’s battery meter, is so not an sign of how the phone’s going to behave for the rest of the battery charge. The speed of bars diminishing picks up like a freight train and by the time it reaches its last few, I am pretty sure it’ll not even withstand a 5 minute call. I have had the chance of observing this phenomena on Nokia, Samsung, and Sony Ericsson phone. Looks like battery charge calculation does not burn down linearly. Imagine the marketing people’s glee when this problem gets addressed. Wishful thinking! Maybe iphone’s tenth iteration would have that. It is amazing, really how media does transform something which is a simple concept to something probably larger than life. Such as the concept “earth hour”, in India. It is funny, jarring, disappointing how people are having says and intents about the earth hour. I mean seriously, how relevant is it. And why should politicians/actors be so interested? Again I’m not the one who has done the research on figures and facts, but I’ve seen the kind of emissions one has on roads these days. Why doesn’t government put a serious check on the number of vehicles running on the road? Not only does it clog up the flow of traffic, causing inconvenience to many a people, and also, with each extra minute a vehicle spends running, amounting to addition to harmful chemicals in the “pure” atmosphere. I mean I haven’t seen Shiela Dixit come up and say … “Delhiites …. carpool benefits by government agenda”. Why not tax the people who have in excess of a certain number of cars. Then I’ve seen people crib a lot about lack of public transport here as opposed to other cities. I think whatever the government does, where Delhi would fall flat on its face is scalability issues. I guess the sheer number of takers is so huge, that whatever they decide to pitch in, would be insufficient, and inefficient. Like the ordering of fleet of buses. I still see them loaded, and crammed with people. And more the number, bigger the original traffic problem. sigh…. I think the new revolutionary idea would be something on the lines of pooling the resources, and utilizing from the pool. Like people pitch in to have a fleet of cars, and they can raise requests, to use a car from that fleet. When a bunch of them need it to travel in the same route, we have a cheap run. When someone wishes for an exotic run, that’s an expensive run. One necessary requirement to accomplish this would be the real-time communication of a persons whereabouts and their plan of travels. Anyways, ideas galore, but Shiela Dixit can only think of raising the numbers. More busses = solving immediate problems. And when she appears on-screen with SRK or someone suggesting you to switch lights for the earth hour, remember, it’s just a gimmick. And if your friends call up how they are doing their bit by turning off their own lights …. they’ve just been roped in. Did I turn off lights during the earth hour? I didn’t have to. there was no electricity. Curiously, people around me give me the puzzled look, when I say I like playing a game. Folks around (especially in India) still assume that playing something is an activity that can only be associated with kids. “Even looked down upon!”. How often, I have seen people raise their brows when I tell them I like to play badminton. Frankly, I’ve even lost count. Or gotten so used to this sequence that I reply mechanically, along these lines. Them: So, what do you do on weekends. 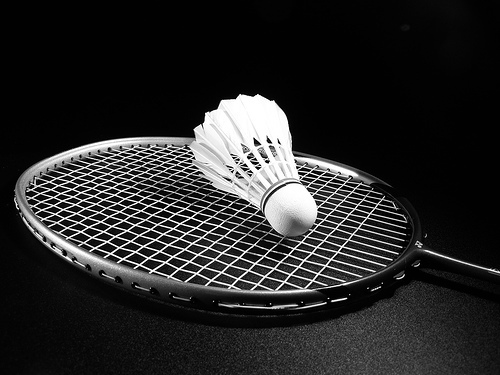 Me: Well, there are many things, but one thing is certain … I play badminton in the morning. Them: ugh… (pausing to digest what I said)… So, do you like play professionally, like state level or something. Them: Ah…. (and the topic shifts to more elderly stuff). So have you tried this new Beer. Anyways, the beer seems like a great conversation starter. For me, however, all beer are the same so I go like “naah … I do not like beer”. And it pretty much slaughters the conversation (and stomps on its carcass). I guess I get branded as an immature imbecile. So, anyways, back the point. What makes me get up, grab that racquet and knock a few. Well, I could think of a few. It requires me to be spontaneous. Ever finished something just in the nick of time? That is a very relaxing feeling. Now, playing (successfully) a return to a killer smash, or a far fetched shot.Very relaxing indeed. It teaches me to be patient. (Wow, ain’t that like opposite of what I just said). There are some skills, that just don’t develop overnight. Like developing a nice serve. It’s through the process of trial and error, and a lot of reflective thinking. Nothing short of a well calculated scientific experiment.Well, inching closer to a player look up to is a very satisfying feeling. But it doesn’t happen in a day. May take months, or years (yeah, there’s a chance it might not happen at all 🙂 ). Morning is a time, I really feel great. However there’s a stress factor, that has crept up in a way which could be best described as stealthy. Well, to tell the entire truth it’s mix of factors, but it’s shaken me enough to take notice and possibly try to solve the problem. The reason is this : I hate going to office. Now, before any conclusions are drawn, and I get a label, let me clarify. The place I have to head to, after getting up from a peaceful night’s sleep, is so detached from peace as fish are from air. To be more precise, it’s a painting of chaos, with a myriad of colors, that are predominantly dull gray, and dirty brown. The drive up till there, is often filled with incidents, accidents, and spats amongst drivers due to road rage and bad mood of people in general. Although, a distance of only 7 kms separates my workplace from my house, the drive on an average 30 minutes long. And not the best 30 mins of my life, in fact something I dread. I work in a company whose office is in Udyog Vihar, Electronic City. At times I do wonder what is the reason for such a mismatched name. There is nothing electronic about the city. There are no roads(if you don’t consider old, tattered mud and stone lined pathways) , no sense of driving among people, traffic policemen, who seem more apt at managing a herd of cattle, rather than automotive traffic. Also, there is this string of huge factories, with Maruti Udyog as a central crown jewel, that contribute in there special ways, to have another dimension to the chaos. The fleet of trucks that emerge from the premises of these factories are humongous, and for a unseasoned driver, the encounter can be pretty daunting. I have to pass a round about near my house, which is full of people, at that point of time, so I get bogged there. Soon, I reach an intersection, where it takes me a minimum of 25% of my travel time to get across. many people, spontaneously decide to switch lanes there, cutting the flow of following traffic, and at times leading to a deadlock. According to me, a U-turn at that intersection is probably the cause of much of the evil. Anyways, 100 meters up ahead, another intersection. Here the mood of majority of the people is to take U-turn, and that cuts off the following traffic. After I get past that, and drive for a couple of kilometers, into the vicinity of Maruti Udyog, it’s the huge trailers, and trucks that decide to play boogie. If any one of those trucks decide to take a U-turn, they cut off the swarm of other smaller vehicles following them. At times, they are deadlocked by the swarm of smaller vehicles on the opposite side of the road. So the swarm of cars behind these trucks grow into a honking mob of drivers yelling out profanities and trying to hustle their way past each other. If I am lucky (many a times I have to re route my approach to come from an equally jammed street, but in circumstances, seems an easier deal), I reach to the final turning to my office. I get into a narrow street with cars parked at both sides me doing a slow and cautious driving as if I’m asked to strictly follow my nose. Very disturbing. Finally, my office parking lot. It’s a mess. The stupid managers cannot seem to come up with a solution. I have thought over it myself, and I have something, which could be handy. But not the management at my office. They do not anything of that. Anyways, after squeezing my car into a tiniest of slots, I go ahead to walk to my office building. That is the time I start breathing easy. And I have just described the best of weather/seasons here. Add to it a rainy day, and consider the place to be nightmarish, as in the skill levels of quake 3. Sorry. Is that really what you mean? Amongst other categorizations of people, here’s a rather interesting one. The people in the particular segment are losers, but hey .. what the heck? They continue to be. Of course people make blunders. There might be few who never seem to, but I call them lucky. Anyways, people make mistakes. In the process, some people hurt others, maybe unintentionally. Others have no plans of resurrecting the wrongful deed, which they deem righteous, or admit that their act is dastardly. And , yet, there are types, who’d say … “Oh I’m really sorry”, without even reflecting to what they’re saying. Well, this post is going to be rant. I am a gadget freak… I have realized it off late. As much as I try to convince myself otherwise . That being said, let me also re emphasize . If a brand comes out with a new product (say apple, and their iphone 3g fiasco, for the sake of example), I’m not interested, till I find a use for it. I do not swear by brands. Well, nonetheless, I also have realized, that I am an audiophile. Good sound delights me in a way that snazzy interface would probably affect mac users. We all have our poison. If you are beginning to think this one’s against apple here, lemme clear it out, no I am not in a position to crib against them. Not a single apple product till date. They just make a good example of “obsessed people”, and crazy marketing. Now, well, back to business…. So, I like good audio. I have lots of products from sony. (Naturally, you might say). O sony .. why must you do this to your users. The headphones are great. I’m loving it, even as I type out this post. But there’s a string (or shall we call it the sony proprietary connector …. eyuuch ) attached to my phone. What a totally useless piece of engineering. I mean look at the number of exposed pins( and the size). Looks like a recipe for disaster, as compared to plain old USB B mini. So, I used to think, sony must’ve got it wrong, you know back in the ol’ days, of lesser standards, and days of experimentation. Look at the picture now. There have been more and enough people who crib about the same problem. Connectors of Sony Walkman phones go bust (aren’t they bound to). My second set of headphones are giving problems, and never have the plain ol’ 3.5 mm stereo connectors suggested anything to those lines. Not even the usb mini ones. Some of the design should be based on experiences, you know, they aren’t kidding when they say that time is the best teacher. The standards are based on the usability, and not due to a desire to capture the market. So who seems goofy now ? Go take a look at the newer lines of Sony phones. They have only one probable line of reasoning … backward compatibility (yeah, with crap). SD card has open specs as opposed to Sony MS crap. SD card is generally cheaper around the market. go check yourself. So, does MS pro offer any technological advantages? Not that I can think of.. or know . Well, so all of you people, snared in Sony world, I urge you to reconsider your next Sony purchase?Is it worth it.Audio stuff from Sony is good, no doubt, but clearly, the company has decided that it does not intend to play around nicely to others, which I feel is a very bad policy, in today’s market. So, what are the alternatives for common sony products, like walkman phones , PSP, and PS3, good headphones?Baah… must go out and buy a new memory stick.